It’s been a busy summer, and I haven’t posted as much here as I normally would have liked. But… I’ve been hard at work learning a new creative photography technique: digital infrared. 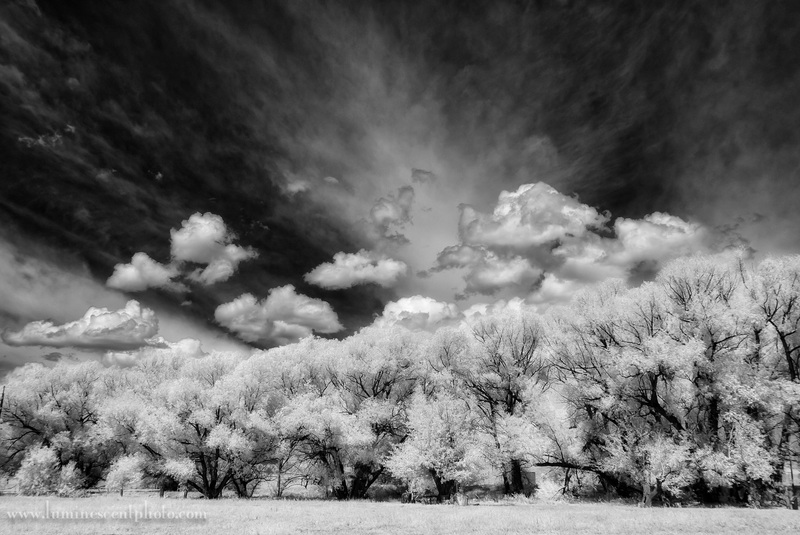 Infrared photography is nothing new, but with digital cameras it’s easier than ever before. In this series of posts, I’ll describe my journey into the world of infrared photography and hopefully pass on some knowledge along the way. While I’ve certainly seen great digital infrared images for a long time, it’s always been something that I’ve put off doing myself. That changed this year for a few reasons. First, I had several opportunities to try infrared cameras during my spring and summer field workshops. Second, I had a very good mentor in Deborah Sandidge, who I call the “Queen of Infrared.” Her insight lowered the learning curve for me and put me on the right track. There are two ways to create digital infrared images. The first method, and least expensive, is to use an infrared filter on your lens. These filters vary in price from $50-160, depending on the diameter of your lens. There are several drawbacks to using this method, however. First, you can’t see through an infrared filter. They block nearly all visible light. That means you’ll need to pre-focus your camera before attaching the filter, and use a tripod. That’s fine for static subjects, but not for hand-held shots. Second, you’re likely to encounter focus errors. That’s because infrared (IR) light does not focus at the same point as visible wavelengths. Older camera lenses sometimes had IR focus markings on their barrels, but most modern lenses do not. The last problem with IR filters is that most digital cameras have an IR blocking (hot-mirror) filter over the sensor to prevent artifacts (blooming) when photographing bright subjects. Because your camera’s sensor will block IR light, you’re going to need a very long exposure if you use an IR filter. The other way to shoot digital infrared is to have a camera converted. To do this, you send your camera to a conversion shop (kiss your warranty goodbye), where they will remove the traditional anti-aliasing filter and replace it with one that allows IR to pass through it. There are several advantages of this conversion. First, you can see through your camera normally, as you aren’t blocking any light through your lens. Second, because the sensor is sensitive to IR wavelengths, exposure times are pretty much normal. Your camera’s metering system can operate as usual, and you can shoot in pretty much any condition with or without a tripod. Even with a converted camera, you still need to be aware of a few potential issues. With all IR images, white balance gets weird. If your camera supports a custom WB setting, your shop will usually send it back with a custom preset. Some RAW converters may not read such a strange WB setting properly, but there are ways around this, as I show here. Focus accuracy is still a potential issue with all infrared converted cameras. That’s because your normal AF module will be focusing with visible, not IR light. One option is to have your camera’s AF system calibrated by the conversion shop. This is a good option, but one that really only works for one lens. There’s no such thing as a universal conversion. On the other hand, if your camera supports Live View Focusing, you can get accurate focus by using the sensor instead of the AF module. Newer cameras have very good live-view focusing systems. Live-view focus tends to work best with a tripod because it’s slower than the normal AF system. It also means that you’ll need to use your camera LCD to focus instead of the viewfinder. This can be tricky with hand-held shots and a heavy camera. The biggest drawback of an IR conversion is cost. Depending on the type of filter you choose, a conversion can cost up to $400 by the time you add in shipping. That’s one reason why I held out so long before I converted a camera… I wanted to choose not only the right camera to convert, but the filter option that I thought would be best. Which Camera Should You Convert? If you’re going to shoot digital infrared, it’s clear that getting a camera converted is the best way to go. Most of us have an older DSLR body lying around that we don’t use much anymore. Here are my thoughts on how you should approach the question of which camera to convert. For most of us, infrared photography is a creative side to our traditional photography. Unless you make infrared your main focus, you’re probably going to be carrying at least two cameras around; the primary (visible) and the infrared. Add another if you usually carry a back-up camera. What this means is that for a non-primary camera, form-factor can be quite important. If you travel by air, you don’t necessarily want to pack another large body and another set of lenses just to have an IR camera. If that’s the case, you’ll find yourself leaving that camera at home more often than not. If you can use a body that is compatible with your current lenses and accessories, that’s a big plus. Also, it’s very useful to have a body that uses live-view. This is not only great for focusing as I mentioned before, but it has a second bonus: Infrared Preview. Seeing in infrared isn’t easy, and it takes time to recognize subjects that lend themselves to IR. If you use Live View, the preview image will be in infrared, making pre-visualization of your shot easier. For the casual photographer or hobbyist, some of the best options might be an old compact camera that you have lying around collecting dust. If you have one that shoots RAW, even better, as you’ll be able to tweak WB and get optimal quality from your images. Although I had a couple of DSLR options available to me, including D300 and D700 bodies, I chose a different direction and had my Nikon 1 V1 converted to infrared. Why? A couple of things stand out about the V1 that make it particularly useful for my needs as a creative option. Of course, it didn’t hurt that I happened to have a Nikon 1 V1 already, which I replaced with the V2 last year. And while it doesn’t have all the conveniences of a DSLR, it’s a very capable little camera that packs very small. Moreover, the CX-format sensor is huge compared to traditional point and shoot cameras, and I can use just about any lens I want on it. I made this choice based on my needs, and with the full understanding that I wasn’t going to get the same image quality as a converted DSLR, but now I have a tiny camera that I can tuck into my bag without the need for an entire second kit. As if it wasn’t hard enough to commit to converting a camera, now I had to choose a conversion option. This is a major decision, as you can’t change out the IR filter (without paying for another conversion, that is). Most of us will only have a single IR camera, so you want to choose the conversion that fits your creative style. There are several choices of conversion available, each with a specific wavelength threshold. Your choice of conversion will impact the creative latitude you have with your images. “Standard” Conversion: This conversion is sometimes referred to as a 720nm conversion. It lets in a very small amount of visible light and is the same type of filter as using a traditional IR filter on your lens. It’s a very good all-around conversion; great for both portraits and landscapes. With a little post-processing skill, you can also produce faux-color images. Foliage will be rendered fairly white, and skin tones will be very smooth. Enhanced Color Conversion: This conversion allows a little more visible (red) wavelengths to reach your sensor. It has a wavelength cutoff of around 665nm. When you choose this conversion, you can create a “blue sky” effect by swapping the red/blue channels in Photoshop. Skies will then be blue, and foliage turns yellow. Super-Color Conversion: This conversion lets in the most visible light (again, reds) of all IR conversions. The cutoff wavelength is around 590nm, which lets some yellows in along with the reds and oranges. This filter choice is quite good if you want to create faux-color infrared images. Black and white images are harder to produce, as foliage isn’t rendered nearly as bright as it is with other conversions. For good monochrome images, you’ll need to have a good grasp of post-processing, and use a program like Silver Efex Pro 2 to get maximum impact. Enhanced Black Conversion: Going in the opposite direction, you can also choose a conversion that has a higher cutoff wavelength. This conversion cuts off around 830nm, and produces strong contrast, dark skies, and bright foliage. With this conversion, you’re pretty much looking at monochrome as your main option, as there won’t be any real color information in your photo. This conversion is excellent if you want high-contrast monochrome landscapes or silky-smooth portrait skin tones. I agonized over which conversion to get for what seemed like months. As a creative photographer, my biggest problem is that I like ALL kinds of creative looks, and I didn’t want to get locked in to a single style. Fortunately, I had played around with super-color IR images over the summer, and I knew that I could process them with Silver Efex Pro 2 for monochrome and get nearly the same look as a standard or enhanced black IR conversion. I also happen to own Photoshop, which makes the red-blue channel swap option possible (you can’t do that in Lightroom; sigh). If I didn’t have the post-processing tools already, I probably would have gone with the 720nm (Standard) conversion. Jason, this is great stuff. Thanks for the in depth look at this. I may end up converting my V1 and getting a new Nikon 1 myself! Interesting stuff indeed. And don’t forget that in choosing the 590nm filter conversion in camera you can still use “deeper” IR-filters externally. Your comments are helpful. I have been agonizing over the type of filter conversion choice. I am still undecided on which conversion to have. Am I correct in saying that due to visible light and infrared light focus at different points, there can be issues with image sharpness with a 590nm conversion compared with a 720nm conversion? There won’t be issues with image sharpness if you use live-view focusing, or have your camera calibrated during the conversion process. Life Pixel includes focus calibration for DSLRs as part of the conversion package.